My father is good at many things. He’s an excellent listener, gifted mathematician, handy about the house, and a well-rounded outdoorsman. He isn’t, however, good at packing light, especially when it comes to fishing. When I was a kid, Dad would pack for our annual steelhead trips as if he were moving the family to a new city. He’d load enough food, clothing, camping gear, and household items into our station wagon to last for a month. My siblings and mother teased him about it, but he ignored us. He liked to be ready for anything. These days, I’m usually in charge of gear, but Dad still thinks big. For a day’s fishing he’ll throw three duffel bags of tackle into the boat, although he rarely takes off his favourite muskie bucktail jig. Now, before dear old Dad reads this and scratches out a rebuttal letter, I admit to occasionally going over the top too. Call me a chip off the old block. Yet, my travels as a fishing writer often force me to scale down to bare essentials. I’ve learned that for most trips I can get by with 10 per cent of my usual tackle. Here’s how I do it. Weight restrictions mean scaling down fishing gear into one compact unit. I like soft-sided tackle boxes with individual trays. Know what you’ll be fishing for and under what conditions so you can pick only what tackle you need. If you’re going into a walleye/pike/bass lake, make individual trays of jigs and twister bodies, crankbaits, spoons, trolling spinnerbaits and odds and ends like hooks, sinkers, steel leaders, snaps, pliers, forceps, jaw spreaders, tape measure, hook hone, and a small first aid kit. Secure tackle so it can’t spill and become dangerous in a float plane. I use a leather belt to tighten down the flaps on my tackle bag. I usually bring as many rods as I can put in one large hard rod tube. Generally, that’s two medium-action spinning rods, a 7-foot flipping stick, and either an ultralight spinning or fly rod. Obviously, if you’re going for brook trout, you can leave heavy gear behind. Have a spare of whatever rod you’re most likely to use. For some reason, I’ve broken more rods on fly-ins than on all other trips combined. Always travel with rods in a tube. Loose rods and reels are an accident waiting to happen, and most float-plane pilots hate storing them in the hold. 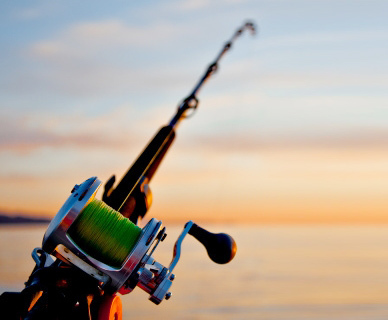 Take reels off rods and pack them carefully with your clothes. Make sure you have at least one extra reel. Be selective about clothing too and err on the side of warmth and dryness. On summer fly-ins I pack shorts, long pants (one pair fleece), a couple of tee-shirts, a long-sleeve shirt, a turtleneck, long and short underwear, a wool sweater, a fleece pullover, warm socks, rubber boots, hiking boots, and rain gear. Take top-quality rain gear. If it pours every day, you’ll be stuck in the cabin or freezing in the boat if you make do with a cheap plastic poncho. I also bring a rain hat and a couple of baseball or sun hats. Polarizing sunglasses, sunscreen, and bug dope are also musts. In spring and fall I bring winter clothes, including a toque, gloves, snow pants, and floater jacket. Check whether the outpost camp has approved personal floatation devices for everyone. If in doubt, bring your own. If you’ve ever had a canvas bag sit on a float-plane dock in the rain, you know how wet gear can become. A waterproof bag solves that problem. I pack all clothing into a waterproof North Face hockey bag. It cost me a couple of skins, but is worth it. Most outpost camps don’t provide depth finders. I always bring a portable unit with two extra rechargeable batteries. Even the most remote lake can have tough fishing, and having a depth unit helps you quickly find reefs and other structure. Again, I travel with a large soft-sided tackle box that zips up securely and can be locked if required. This box is checked as luggage. All terminal tackle goes into it. If your tackle box has a strap, make sure it’s tightened and not hanging loose. Tackle also needs to be secure on airline flights, as all packages are man-handled and, again, a spilled tackle box is bad, bad news. Rods also need to be packed carefully in a top-quality hard case. Good ones are worth the extra money. I’ve had lightweight plastic rod tubes look like bananas when they came out of a plane. All rod cases should be padlocked. As an added precaution against theft, I wrap the top of the case with duct tape. Make sure your name, address, and phone number are displayed prominently on the tube under clear tape. Find out if rod tubes will be treated as regular baggage or carried to a baggage claims area. Rods can be stolen in special baggage areas far from the carousel. Again, pack reels with clothes in a suitcase or a secure pack. Remember, most airlines restrict checked baggage to two or three pieces, so inquire about such rules before you leave home. You’ll be charged extra for excess baggage. While security and weight are primary concerns of air travellers, compactness and length loom large when you have to fit everything into a backpack for fishing from a canoe. Carrying a 7-foot one-piece spinning rod is obviously out. So is that big tackle box. It’s unwieldy and often requires an extra portage. Scale way down. Thankfully, there are high-quality pack rods. One of my favourite fly rods, a four-piece Sage, fits in a 3-foot aluminum tube. There are also packs that have places to slip in pack rods and small plastic tackle boxes. Keep presentation choices basic. For instance, if I’m going into a park where walleye, bass, or pike are the main fish, I bring a large selection of 1/8- to 1/2-ounce jigs, lots of plastic twister bodies, a half-dozen pike spoons, and maybe a handful of crankbaits and top-water lures. All this fits easily into a couple of small plastic boxes. If you’re trout fishing, a selection of flies, small spinners, spoons, and jigs will cover most needs. Fly anglers have it easier, since they can bring hundreds of flies that weigh almost nothing and take up little room. Wearing a fishing vest can help you carry more tackle, but they’re no fun if you have to put a pack on top of them.